This book is yet another stone in the path of musical history in the United States. New Orleans may have been the point of entry for much of the music which came from Africa and the Caribbean, but Memphis is one of the towns in which it was reshaped into its own unique form. The Memphis Blues is different than let’s say Chicago Blues, or Delta Blues. They may all have begun at the same place, but the journey up the Mississippi left its own mark on the music with each town it passed through. 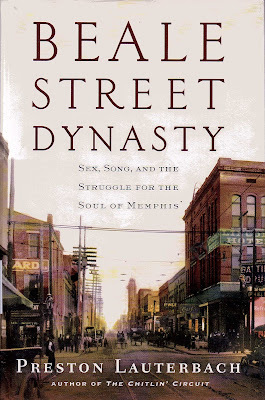 Just as in his earlier book “The Chitlin’ Circuit and the Road to Rock and Roll”; which I reviewed here in 2011, Mr. Lauterbach brings to life the tumult of post-Civil War Memphis and the interracial society which sprang up there in the days before Jim Crow. Memphis was a virtual Mecca of the way things should be regarding race relations. There were African-American lawyers, barbers, accountants, newspapers, hotels and everything else you would expect in any community in the 1870’s. Politically the town was also seemingly color blind, and with the guidance of Robert Church, a mulatto steam boat Captain, the town continued to thrive. As a matter of fact, in many ways it was the exact opposite of other Southern towns. In many ways the African-Americans were prospering, and even leading, in the areas of finance and entertainment. Interracial marriage was a common thing and African-Americans enjoyed most of the privileges of their white neighbors. But, with the advent of the First World War came the first harbingers of change. Just as in New Orleans, the authorities clamped down on the music and the prostitution, and strengthened miscegenation laws to keep the races apart. The story of Memphis, Robert Church and W.C. Handy; along with scores of other musicians; is widely known, but Mr. Lauterbach has taken the politics of the time and melded it with the cultural and criminal elements which made Memphis the place it was then, as well as today, and turned it into an all-encompassing history of Beale Street and the blues in Memphis . Who is a Citizen Under the Constitution?